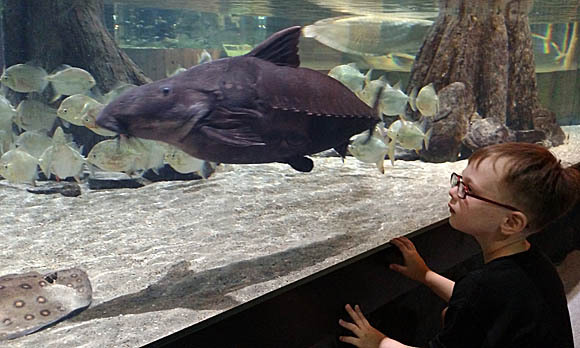 CLEVELAND, OH – If you can’t be out catching fish, the next best thing is either telling stories about fish or looking at them. 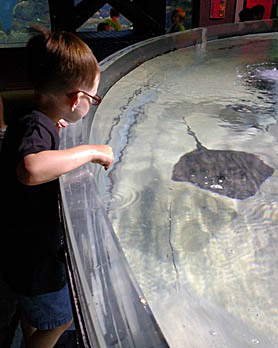 When it comes to looking at them, there is no better place in the area than the Greater Cleveland Aquarium. Northeast Ohio has no shortage of great venues to visit, but to fish crazy folks like myself, this place is in a class by itself. I love that a short drive can get me up close to the fish I love, as well as, saltwater and other exotic species that I would otherwise not encounter locally. 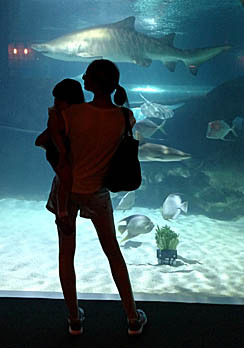 I’ve been to the aquarium a handful of times, and I can summarize this post by saying, “it is worth a visit”. More accurately, it is likely worth multiple visits and at least a trip annually. I probably sound like a paid spokesperson, but don’t worry, I am offering my honest appraisal. As I dive in (pun intended), one of the first things to prepare for is the cost. I think many people would consider the price steep. My family of four that included a 4 and 2 year old, was just under $70. This included 2 free return tickets for the kids and 2 free hotdogs. When you think about the number of staff and other costs with maintaining so many tanks, it does make sense that tickets might need to be a little pricey. Also, if you are savvy at coupon hunting, they can be found. As you enter the aquarium, it may not be what you expect. For me, I thought it would be a huge wide open area. The layout would be better described as a labyrinth. This has grown on me after multiple visits, but the first visit it made me feel a little claustrophobic. Now the idea of following ‘a path’ through corridors and rooms gives it a more intimate feel. I also prefer smaller pockets of people distributed across the entire complex over a ‘grand ballroom’ of the masses. The first area you enter has the more familiar species. I like that the aquarium pays homage to our local fish and shows a lot of the fish diversity we have. This seems important to me for education. I know many schools do field trips here and I think it is awesome that they get to see what is swimming in the waters around them. I have to believe this encourages appreciation for what we have. 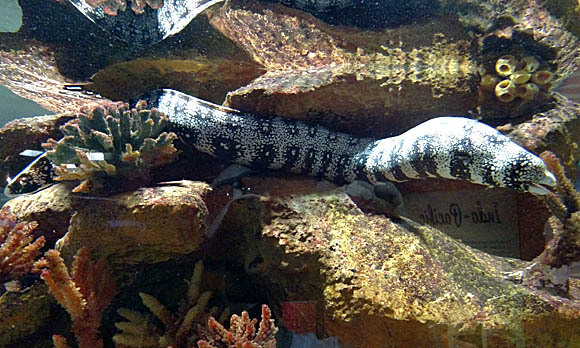 It is also worth noting that the aquarium doesn’t just have our fish, but some huge examples. Just because you know a place to catch a Bass, Bluegill, or Crappie, doesn’t mean you can find ones like they have in their tanks! Many are well over “Fish Ohio Award” size. 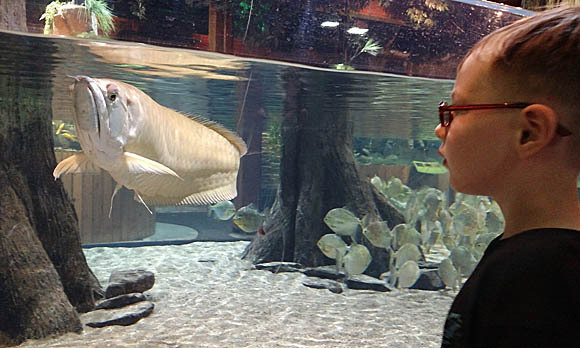 As you venture further into the aquarium you encounter fish from all over the world. 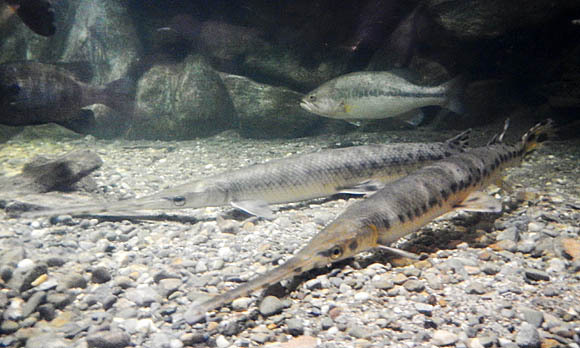 This includes other freshwater fish and saltwater. One neat aspect is that a good number of the tanks are open top and low enough to let visitors get a birds-eye view. This is a cool perspective and not the typical side view only, as most other places. For a fisherman, this gives the view you use when site fishing and it is very appealing to view the fish as you would if you were targeting them. This might not be appreciated or noticed by most visitors, but as an angler, it is neat. I also like it that all of the tanks are not uniform. The tanks have variety in shape and size. The diversity of fish represented is quite good. Around every turn, every tank, has something new and interesting to see. Lighting is low, with the tanks both figuratively and literally having the spotlight. It really makes them stand out and they truly are the star of the show so to speak. I’m not sure if it is this lighting, the thickness of the glass, or just that the fish are often moving – I find it difficult to get good pictures. I also get reflections from the glass. Maybe better equipment or a more skilled photographer could navigate these variables better than I can. This is in no way anything against the facility, just something I wanted to note. One unexpected surprise on my initial visit was the multiple areas of direct interaction. The photo above is a tank where you are allowed to put two fingers into the water to pet the passer-byers. 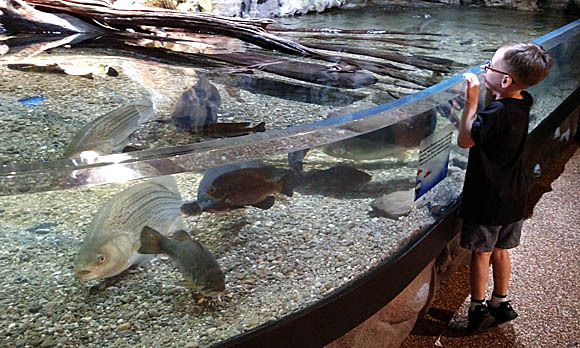 Another area you can put your hand in the water to feel different live critters. My most recent visit, I had my hand in a tank with some kind of shrimp or prawn that likes to eat dead skin. It was very neat to watch and feel this. Certainly, this type of experience was far more interactive than anyone would anticipate. I also want to note there are a few play areas where my 2 year old could run around and enjoy, when her attention span was lacking. I also like the wall with a beach mural, with chairs in front of it creating a cool photo op. There’s more, but I don’t want to spoil it all! 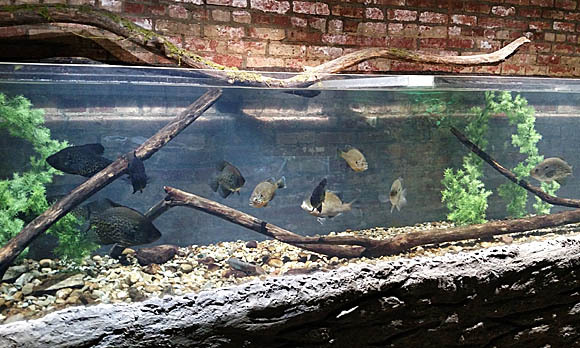 As you wind your way through the aquarium you will encounter neat features, such as an area where the tank goes from both sides and across the ceiling. It is immersive and expansive in length. All of this leads to the final focal point, a massively large 250,000 gallon saltwater showcase of sharks and other awesome fish species. While the sharks are the main draw for visitors, I find myself always looking equally at the fish that co-habitat the tank. I recognize a great deal of the species from my Instagram feed of anglers that fish saltwater. I once again can say the fish aren’t just represented, but represented well in their size. At the exit is a gift shop, and by gift shop standards, the prices are modest. My son had his heart set on a 50 piece underwater playset, which we purchased for $19.99. This seemed the same for an equivalent item from Toys-R-Us or other major retailor. In my closing comments I want to add that the staff are all friendly and I have only had positive interactions on my visits. I find it very professional that if you don’t want bothered, they leave you alone. If you want more information, they are eager to share their knowledge. This is perfect. 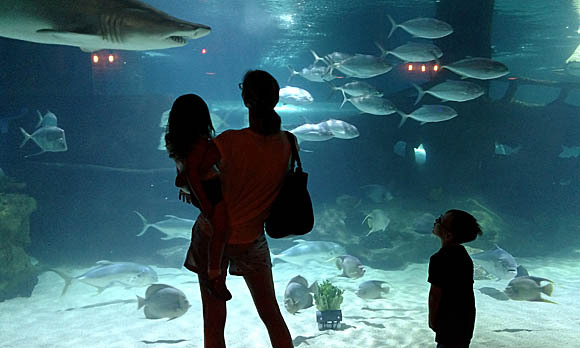 Getting to and from the aquarium is easy and parking was just $3. I’ve only been to the aquarium earlier in the day, so I am not certain if the price jumps at night/weekend. The lot is plenty big and I’ve never had any issue finding a spot close to the entrance. The aquarium itself has a great location on the Flats West Bank. You can easily incorporate some other fun such as food/cocktails at Shooters, a ride on the Nautica Queen, or a kayak/jet ski rental at Great Lakes Watersports. The water taxi is also close by in case you want to cross the river to another venue. My overview makes it pretty obvious I enjoy the Greater Cleveland Aquarium, please feel free to comment with your thoughts/ experiences.